Last week on Twitter @getify started an excellent thread pointing out that we should be using HTTPS even on our local machines. Why? You want your local web development set up to reflect your production reality as much as possible. URL parsing, routing, redirects, avoiding mixed-content warnings, etc. It’s very easy to accidentally find oneself on http:// when everything in 2018 should be under https://. I’m using ASP.NET Core 2.1 which makes local SSL super easy. After installing from http://dot.net I’ll “dotnet new razor” in an empty folder to make a quick web app. 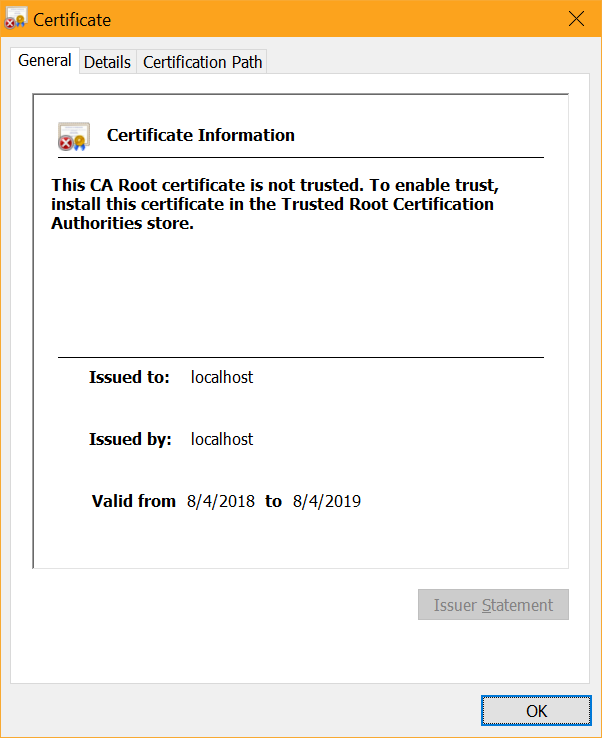 I just need to run “dotnet dev-certs https –trust” and I’ll get a pop up asking if I want to trust this localhost cert..
On Windows it’ll get added to the certificate store and on Mac it’ll get added to the keychain. 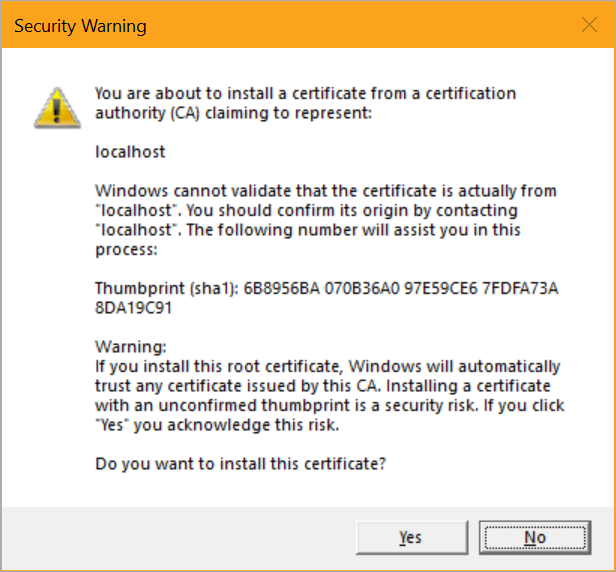 On Linux there isn’t a standard way across distros to trust the certificate, so you’ll need to perform the distro specific guidance for trusting the development certificate. Close your browser and open up again at https://localhost:5001 and you’ll see a trusted “Secure” badge in your browser. Note also that by default HTTPS redirection is included in ASP.NET Core, and in Production it’ll use HTTP Strict Transport Security (HSTS) as well, avoiding any initial insecure calls. That’s it. What’s historically been a huge hassle for local development is essentially handled for you. Given that Chrome is marking http:// sites as “Not Secure” as of Chrome 68 you’ll want to consider making ALL your sites Secure by Default. I wrote up how to get certs for free with Azure and Let’s Encrypt.